Water damage in your Kingston/New Paltz home? Check out these FAQ's to help get through it successfully! 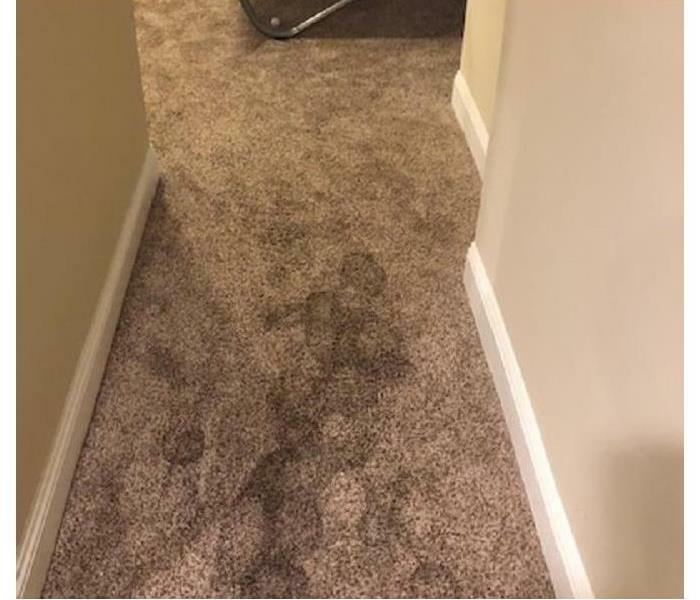 Wet carpets can turn into a larger problem quickly. SERVPRO of Kingston/New Paltz will take care of it quickly and effectively. I don’t even know where to start, what do I do first? When it comes to water damage, the cause of the loss must be repaired first. Call a plumber to get the problem repaired right away. We highly recommend you then file a claim with your insurance company. Next step, call SERVPRO of Kingston/New Paltz, no matter the size of the disaster and no matter what time of day. Our dedicated professionals will gather all needed information and schedule an estimator to meet you. Our estimates are FREE and we work directly with your insurance company to help cover the costs of the damage. In most cases, you’re only responsible for your insurance deductible. However, no two losses are ever the same, we’re happy to explain the course of action. What about my damaged items? Our teams are trained and certified in Water Damage Restoration. They will remove all damaged contents that are salvageable. They will be cleaned, dried and returned to you promptly. We have state of the art drying equipment to take care of it all from couches to clothing to important documents, photos and electronic equipment. Everyone talks about mold, do I have to worry about that too? Fixing the leak and drying out all affected areas in quick fashion helps stops the growth of mold spores. Mold likes warm and damp environments, that’s why you’ll often see it in basements, crawl spaces and sometimes attics. As part of our drying process, we use green- based anti-microbial products to inhibit any mold growth, in addition to SERVPRO’s proven mold prevention techniques and protocol. Time is key here, the quicker the areas are remedied, the less of an issue mold growth will be. How long will this all take? It sounds lengthy. This answer often depends on the size and severity of the damage but our estimators, production managers and technicians will be with you step by step. We pride ourselves in using effective methods as well as being efficient and timely. We understand how stressful this type of situation is and we’re eager to help get your life back to normal as quickly as possible. Check out some of our testimonials from some previous clients! Call us if you need us, no matter what. 845-255-4334. Help keep your Kingston/New Paltz home dry and mold-free! 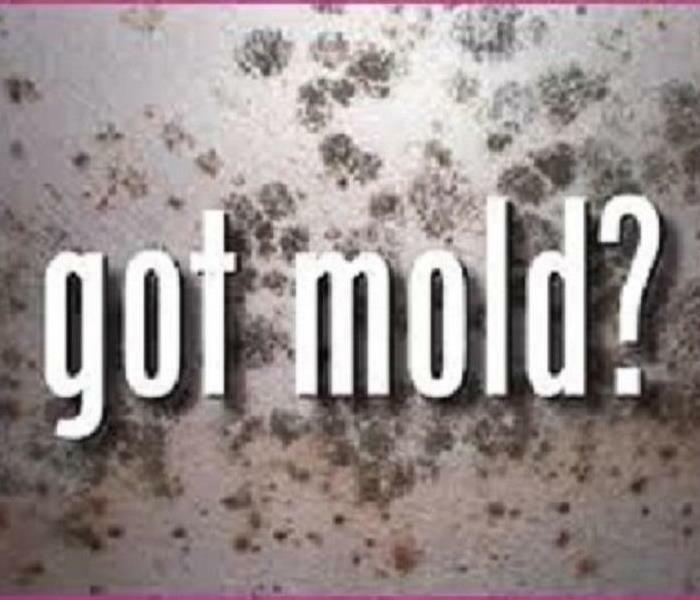 Mold grows in warm and damp environments. Keep it cool, keep it dry! Mold can be a nightmare for any Kingston/New Paltz homeowner as well as cause some health issues. Try to keep your home under 72 degrees. Don’t leave wet clothes and towels lying around. Mold can start to grow on wet clothes in under 48 hours. Clean and dry all surfaces. Sinks and floors and even walls are likely to have mold if they are damp for too long. Keep them clean, keep them dry. Run the fan in your bathroom while showering, open a window if you can. Improve your airflow. Keep furniture away from the walls. Leave your closet doors ajar. Try the fan and an open window rather than the air conditioning. Try a dehumidifier. Dehumidifiers are great for basements and any room that can grow damp. Not only can these step help leave your house smelling fresher and feeling dryer, it can help promote better health as well. If mold has become an issue in your home or business, our certified techs have your back to take care of mold remediation. Call us today and we'll walk you through it all with ease. This Desiccant Dehumidifier can make easy work of drying out a large amount of space. No matter what kind of damage your Kingston/New Paltz commercial building has suffered how overwhelming it might feel, here's a peek into how we handle the loss so you can go right back to business. When you have a large loss, you break out the juggernaut to help get it dry. This mammoth machine is a Desiccant Dehumidifier. A desiccant dehumidifier has a moisture absorbing wheel inside the unit that is made of silica gel – which is the desiccant (drying) element. Air enters the unit through an opening and travels through the silica gel wheel. When the air reaches the other side of the wheel it is dry and pushed out of the unit by a high static blower. Kingston/New Paltz home or business owners! Do you know the 3 Categories of contaminated water? This is most certainly not plain, old water. This is Category 2 water! When dealing with water damage in your Kingston/New Paltz home or business, there are a lot of things to think about. One of the key questions our experts will need to know is if the water affected more than one area or floor? It’s important for us to know what we might be working with and if contaminated water is part of it. This might not be the case for your loss, but our Production Managers will determine the extent when they’re onsite. Category 1: Source of water that does not pose substantial threat to humans and classified as "clean water". Things like a broken water supply line, tub or sink overflows or appliance malfunctions are generally a Category 1. Category 2: Contains a significant degree of chemical, biological or physical contaminants and can cause discomfort or sickness when consumed or even exposed to. Known as "grey water". This type carries microorganisms and nutrients of micro-organisms. Examples are toilet bowls with urine (no feces), sump pump failures, and water discharge from dishwashers or washing machines. Category 3: Known as "black water" and is grossly unsanitary. This water contains polluted agents, harmful bacteria and fungi, and can cause severe discomfort or sickness. These contaminated water sources that affect the indoor environment and includes water sources from sewage, seawater, rising water from rivers or streams, ground surface water or standing water. Category 2 Water or Grey Water that is not promptly removed from the structure and/or have remained stagnant may be re-classified as Category 3 Water. Toilet back flows that originates from beyond the toilet trap is considered black water contamination no matter what color it is or what content is in it. 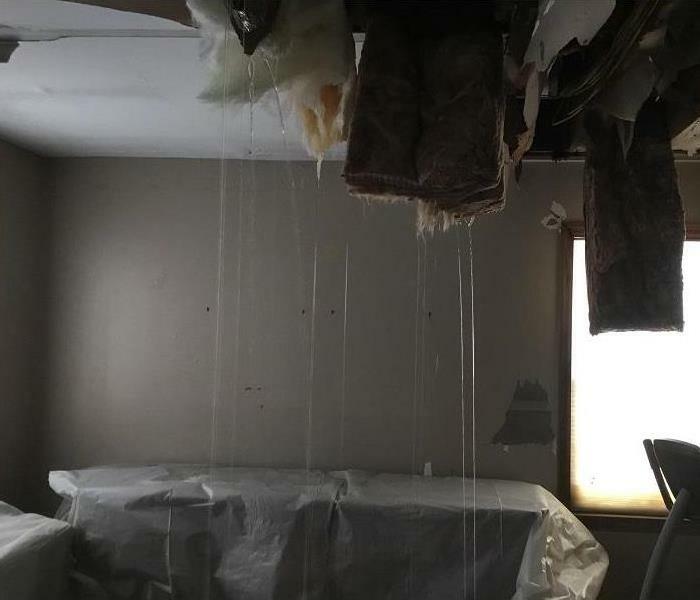 This photo is an example of water damage that started in the 3rd floor of the home, traveled through sheet rock, insulation and hard wood floors (which have laminate on them) and finally came out through the ducts in the basement. This water was classified as Category 2 as it was loaded with physical contaminants. Our water damage remediation experts at SERVPRO are certified by the Institute of Inspection Cleaning and Restoration Certification and follow precise protocols and procedures for cleaning and disposing of this contaminated water. Water damage? Call SERVPRO of Kingston/New Paltz at (845)255-4334 and we’ll be by your side through it all. We’ll get you the answers you need and the team of experts on the job quickly and help ease the stress of the situation. Our team is faster to any size disaster! The longer the damage sits, the higher the costs can be. When facing the results of disaster that has struck your home or business, you don’t have time to spare. When it is your home or livelihood on the line, you don’t want to wait for cleanup and restoration—you need it right away. We understand just how important a fast response is, which is why responding faster to any size disaster is more than just a slogan to us. When your belongings or business are on the line, time is not a luxury you have regarding disaster cleanup. In fact, time can work against you when water damage is involved, which can happen through anything from flooding, appliance and/or plumbing failures, and storm damage to water used to extinguish fires. 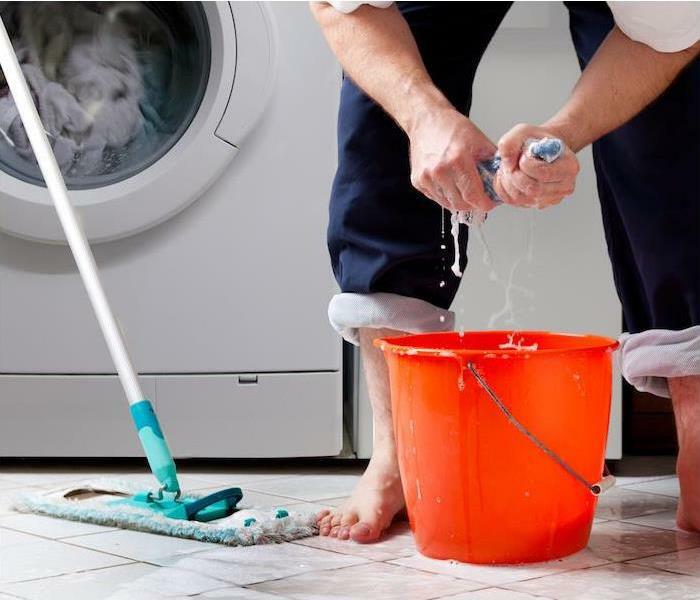 The walls, floors, upholstery and your belongings fall victim to the water as it only takes mere minutes for water to spread throughout your property, where it will saturate everything in its path. If you wait longer than a week, water damage that is left unchecked can lead to a longer restoration time and higher costs, as well as impact the structural safety of the building. Our trained cleanup and restoration specialists can be dispatched to your property or business at any time, no matter what day or time it is. We can provide an immediate response to any size disaster, which can help minimize the damage and help keep the cleaning and restoration costs manageable. As a locally owned and operated franchise, we are close at hand, ready to respond whenever the call comes in. A major perk of being part of a national network of over 1,700 franchises is that we have access to more resources for the cleanup and restoration projects that may be larger or stem from major storm situations. Remember, if you need us, we’ll be there—no matter the time or day. 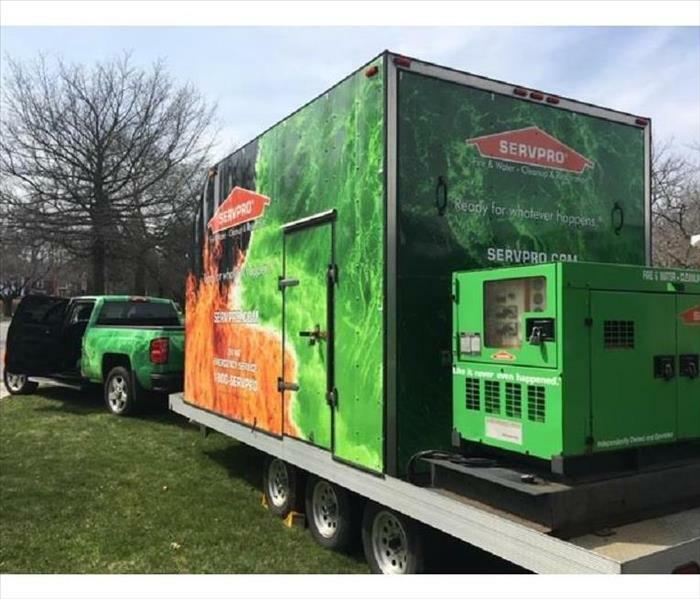 The team of highly trained restoration experts at SERVPRO® of Kingston/New Paltz is available for emergency cleanup and restoration services 24 hours a day, seven days a week. Call us at (845)255-4334. Sheet rock and insulation can only hold the weight of water for a short period of time before saturation kicks in and gravity is the winner. 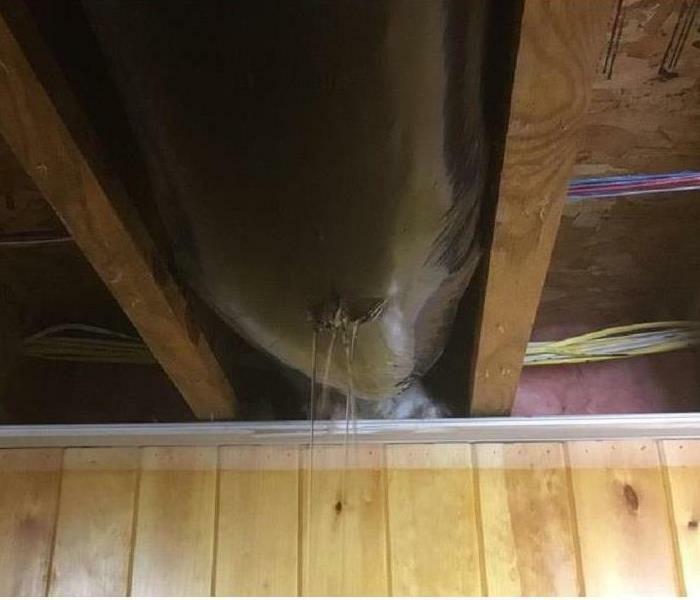 You're enjoying a well-deserved tropical vacation when you get a call from a relative checking on your home….it's been 10 degrees there for days, pipes in your attic have burst and what seems like your entire home has water damage from top to bottom, parts of ceilings have come down and the crawl space is an igloo. 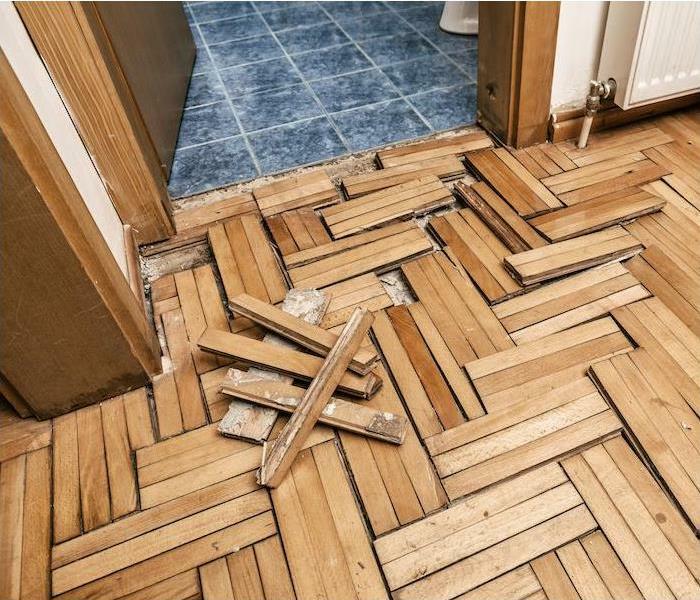 It's not just a wet floor that will dry, WATER DOES THE MOST DAMAGE and will find whatever way it needs to get out. Insulation, sheet rock, everything gets soaked and then gravity and weight take over. Before you realize it, every surface, every item, just about everything you have has some sort of debris, dust, moisture, bits of sheet rock and insulation on it. This type of damage needs to be remedied quickly before secondary issues arise. Heating/plumbing systems fixed, everything needs to be dried out from floors to walls to ceilings, including removal of the damaged areas. Personal items and contents must be relocated elsewhere, cleaned and stored, and then reconstruction can start. Thankfully, the experienced crews from SERVPRO of Kingston/New Paltz were able to start remediation services right away and the homeowner will be able to resume their vacation very soon. We’re with you every step of the process, to make it better than new, to make it "Like it never even happened." Do you have a fire plan in place for your business? Safety for your employees and visitors is just one of the factors business owners need to consider. If you are a business owner, one risk you will need to spend some time planning for and working toward preventing is a fire. Of those causes, intentional, exposure, and electrical distribution and lighting equipment accounted for the most property damage with 20%, 18% and 15% respectively. It was reported by the Bureau of Labor Statistics that in 2007, fires and explosions accounted for 3% of all workplace fatalities. Looking at more recent numbers, the NFPA estimates that from 2007–2011, U.S. fire departments responded to an average of 3,340 fires in office properties per year, which resulted in an annual average of four deaths, 44 injuries and $112 million in direct property damage. 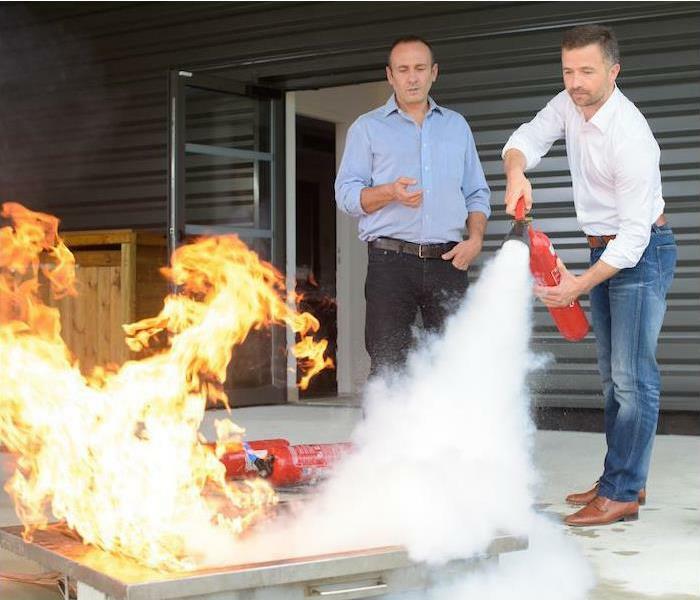 By focusing on fire risk assessment, fire prevention and staff education, there are steps you can take to protect your business and help reduce the chance of a fire breaking out. First, make an assessment of any fire hazard risks in your facility. In some locations, your local government may have a fire marshal that can visit your establishment to help identify these risks and provide guidance on your fire prevention plan. You’ll want to make sure that the right fire protection equipment is in place. This includes an automatic sprinkler system, smoke detectors and fire extinguishers on each floor. Finally, you must consider the safety of your employees and visitors. By creating a fire plan and regularly reviewing it with your staff, you’ll ensure that everyone knows what to do in the case of a fire. To keep fire safety procedures fresh in everyone’s mind, conduct fire drills at least once a year, and take time to review evacuation routes and the locations of your first-aid kits. Despite best efforts with fire prevention and safety tips, the worst could always happen at your business. If a fire has damaged your business, SERVPRO® of Kingston/New Paltz is available to help make it "Like it never even happened." Store our number in your phone, 845-255-4334. Know the types of flood waters that can damage your home! When you think about the water that causes water damage, it is easy to think that it is all the same. But did you know that there are three different classifications for it: clean, gray and black? It won’t matter what type of water has caused damage, though, there will always be a cleanup and restoration process you will have to go through in every situation. The most important step to take—no matter what type of water is involved—is to remove all of the moisture and damp items quickly, so that mold cannot begin to flourish in its ideal environment. Clean water will be the easiest kind of water damage to clean up after as there will be fewer microbes living in the water. However, after 48 hours and contact with building surfaces, clean water can move up to category two and become gray water. Gray water is where water damage cleanup and restoration starts to become a little bit more complicated. This is water that may pose a health risk, due to it containing some chemical and/or biological contamination, which means it will be necessary to thoroughly treat it before it is consumable. Gray water examples are waters that come from dishwashers, aquariums, showers, etc. The 48-hour exposure time applies here as well, since gray water will turn into black water if not treated. Black water situations are considered the most serious of the three classifications. This type of water is considered highly contaminated by hazardous chemicals and biological matter. This will be floodwaters that contain soil and sewage. Sewage is contaminated with microbes, including bacteria, protozoans, molds, fungi and more—many of these can be harmful to humans. The best way to treat all floodwater is to consider all waters involved are black water since it will pick up contaminants along its path. All of the three classifications of floodwater are recognized by the Institute of Inspection, Cleaning and Remediation Certification (IICRC), an organization which certifies and sets the protocol for the cleaning and restoration industry. Our technicians all study IICRC standards and best practices in water restoration and are available to help determine the steps to take to get your home back to normal. It doesn’t matter what type of water has caused damage to your home or business, SERVPRO® of Kingston/New Paltz is here to help get the situation under control and make it "Like it never even happened." Don’t hesitate to reach out to us if you need emergency cleanup and restoration services! Call us at 845-255-4334. Water damage can be one of the costliest damages to experience in a home or business. Water damage is one of the most common and costliest disasters your home may suffer. Things like a burst pipe, a malfunctioning dishwasher or storm damage are just some of the many ways water damage could strike your home. There are a number of steps you can take to protect your home from water damage. Read on as we take a look. Water damage may not seem like much of a hassle for you to deal with, but drying out and cleaning up will prove to be tedious, not to mention there is a good possibility mold will follow. Mold is a very common side effect of water damage, as mold can begin to grow and flourish within 24–48 hours of moisture exposure. When considering ways to safeguard your home, it may be helpful to break it down by areas of impact, such as by basements, kitchens, bathrooms, flooring and ceilings. In the basement, you can prevent water damage by preventing water seepage, which can be done by resealing vulnerable areas of the basement, making sure water drains away from your home and installing a backwater valve. Kitchens and bathrooms may experience water damage as a result of plumbing issues and/or appliance failures. While we would like to protect our possessions in our home from water damage, that is not always possible, but there are things you can do to at least decrease the amount of damage. When storing items in a basement, it is best to use waterproof bins, as well as store items on shelves up off of the floors. If you have suffered water damage to your home, there is a good chance you can salvage items that can be dried out within 48 hours. The first step is to contact your insurance provider immediately and evaluate the extent of damage to your home and possessions as well as identify the type of water that is involved. Clean water is water from rain, condensation, leaky pipes, etc. Gray water is water from dishwashers, washing machines, clean toilets, etc. Black water is water from sewage or serious flooding from nearby rivers, etc. and can cause serious health problems. Following a water damage disaster, you will need to dry your home out quickly by removing wet objects and dehumidifying the area. You must then disinfect all remaining materials. Pro tip: By freezing wet books, photos and papers in a frost-free freezer, you allow yourself some extra time to deal with them. Doing this prevents mold and mildew from developing and causing more deterioration. Once able, you can remove them from the freezer and air-dry or fan-dry the pages. 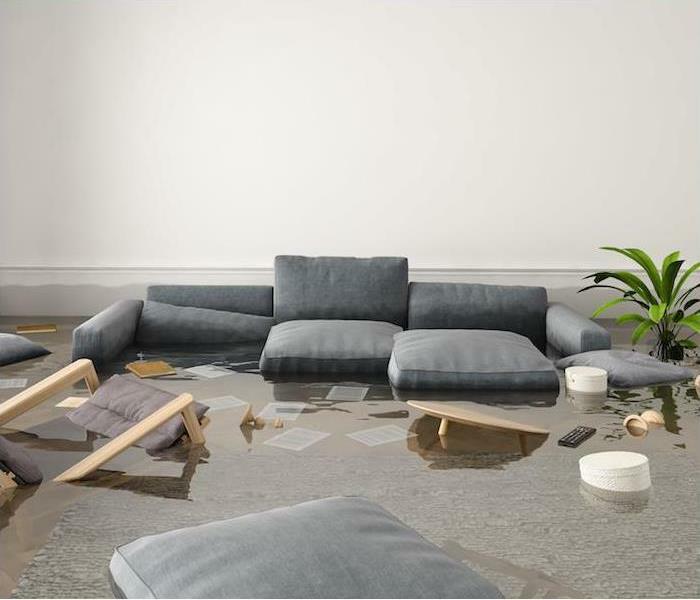 It may seem like recovering from water damage is an overwhelming and slightly impossible task, but it doesn’t have to be. You can call on the highly trained experts at SERVPRO of Kingston/New Paltz at 845-255-4334. We are here to make it "Like it never even happened." 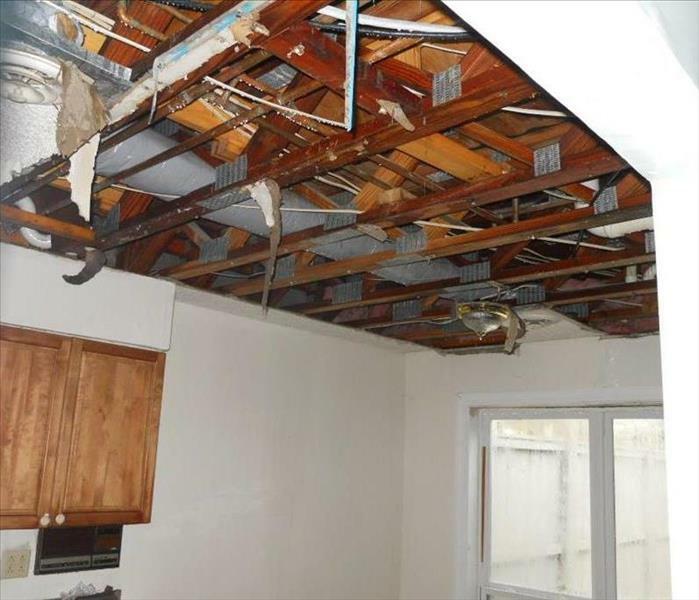 Keep an eye on your vacant property to help avoid this water damage! If you own a 2nd home, rental property or have a vacant property for sale, it's important to have it winterized before the winter starts and to have someone available to check on it for you while it's vacant. While there are always unforeseen issues that can happen, it's the water that causes the most damage. Water can and will get into everything, continuously finding a way out is the name of the game. Don't turn the heat off in the colder months, follow good instructions to protect your pipes and utilities, have your furnace and heating systems checked regularly, seal windows and doors if possible, check outside spigots and water sources. Speak with your insurance agent about tips they have and make sure your policy is where it needs to be. Should you ever suffer from water damage, or any kind of loss to your property, call the experts in damage restoration. SERVPRO of Kingston/New Paltz has been the local leader in the industry for over 25 years, we're here for your emergency 24/7 with certified technicians and the best technology around. Call us immediately so we can give you piece of mind quickly, no matter the damage and no matter the size, 845-255-4334. 4/18/2019 - Water damage in your Kingston/New Paltz home? Check out these FAQ's to help get through it successfully! 4/10/2019 - Help keep your Kingston/New Paltz home dry and mold-free! 4/3/2019 - Kingston/New Paltz home or business owners! Do you know the 3 Categories of contaminated water?